PHILADELPHIA, Oct. 27, 2016 /PRNewswire/ -- Scannapieco Development Corporation, the developer known for creating the ultra-luxury niche market in Philadelphia, introduced the first automated parking system to Philadelphia luxury real estate in 2008. Now, Scannapieco will bring the first wireless induction charging system for electric cars in the country. In partnership with Westfalia and Plugless, 500 Walnut will be the first and only residential tower in the country to charge electric vehicles– from Tesla to Cadillac – with no cords or plugs, or any work on the user's part. This advanced offering, within an already-innovative amenity, addresses the ever-evolving and intricate demands of the ultra-luxury buyer. "Not only do we implement the latest technology in all of our projects, but we constantly work to identify forward-looking trends and advancements that simplify everyday living for our residents," said Tom Scannapieco, President and CEO of Scannapieco Development Corporation. "Given the rising popularity of luxury electric vehicles, we feel this amenity will become ubiquitous in luxury living. As a testament to our belief in this future trend, we are proud to have selected luxury electric vehicle brand, Tesla, as 500 Walnut's town car – another Philadelphia 'first'." Scannapieco's signature ultra-luxury amenity, the underground automated parking system, allows for ultimate convenience and ease for residents of the sleek, glass 26 story residential tower. 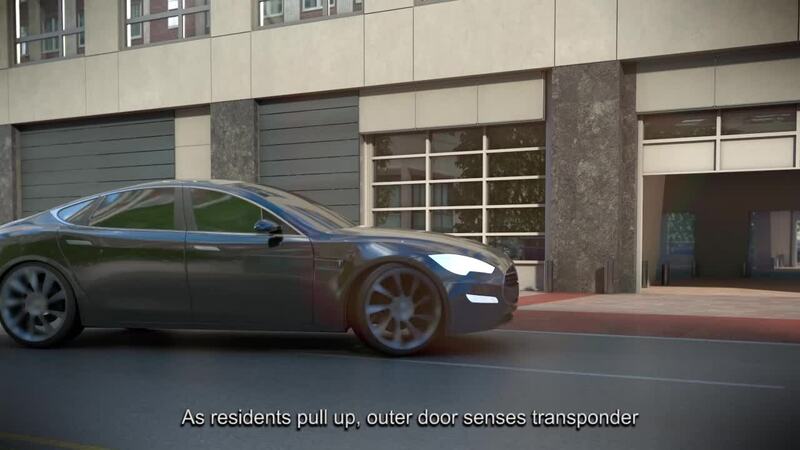 As residents pull up to the building, an outer door senses a transponder and the driver enters a covered courtyard space with elegant finishes. An interior courtyard door automatically opens leading to one of two parking rooms, where an electronic panel guides the driver to placement on a platform. After engaging the emergency brake, residents exit and swipe a fob, which lowers their vehicle on the platform. As the vehicle descends below, it is automatically parked without any human intervention – no valet or self-parking required. Residents walk through a glass door into the main lobby, gather packages from the concierge, and proceed to the elevator up to their residence. To accommodate residents with electric vehicles, Westfalia, the creator of the automated-parking system, partnered with US-based company, Plugless, to bring the adaption which makes the wireless EV charging possible. The Plugless Level 2 EV Charging System is the first wireless electric vehicle charging system in the world. The advanced induction system uses magnetic fields to transfer energy from a transmitting coil in the parking pad to a receiving coil – a customized piece which is installed in the vehicle adapter, which converts the energy into electrical current to charge user's electric vehicles. "Scannapieco was the first in his market to embrace the automated parking system, so he was already familiar and educated on the importance of this innovative advancement. We are thrilled to partner with him on offering the next generation of this automated system at 500 Walnut," said Dan Labell, President of Westfalia Technologies, Inc. "Scannapieco and his team's attention to detail and level of interest to all facets of automated parking- from throughput, reliability, redundancy, after sale support, and the first inductive electric charging system- has galvanized our relationship and our commitment to ensure the success of this project." "Plugless is the most tech-forward, premium charging experience available to EV owners," said Ned Freeman, Vice President of Marketing with Plugless. "The Plugless integration with robotic parking at 500 Walnut means residents will have their EVs returned to them, fully recharged, without a single hand having touched their car. This is not just ultimate convenience today – it's the future of mobility." Overlooking the iconic Independence National Historic Park, 500 Walnut is positioned on the cusp of the birthplace of American democracy. With expansive views of the city's bridges, rivers and ever-changing skyline, the building is a feat of innovation as revolutionary as the history it looks upon. As each terrace gazes directly onto Independence Hall, residents will have a personal view of the building where the US Constitution and the Declaration of Independence were conceptualized and signed. Just as the barriers of possibility were pushed over 200 years ago, the ultra-luxury tower is expanding the possibilities of what innovation looks like today. Construction of 500 Walnut began in March 2014. Occupancy will begin in Spring 2017. For additional details, visit www.500Walnut.net.